In the Gallery, you can see examples of my work. When viewed on a laptop or PC a description of each photo is displayed, and moving the cursor over a full-size image pauses the slideshow. 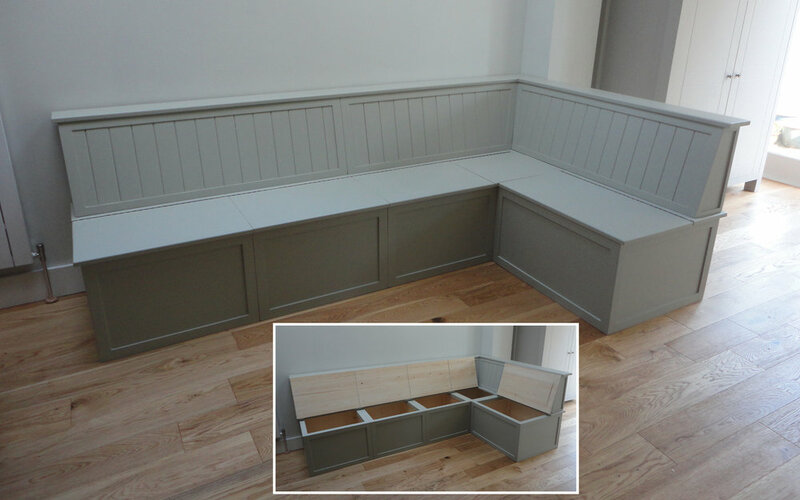 The kitchen corner bench seat made from birch plywood and solid pine (with a paint finish matched to the existing furniture) provides significant storage space. 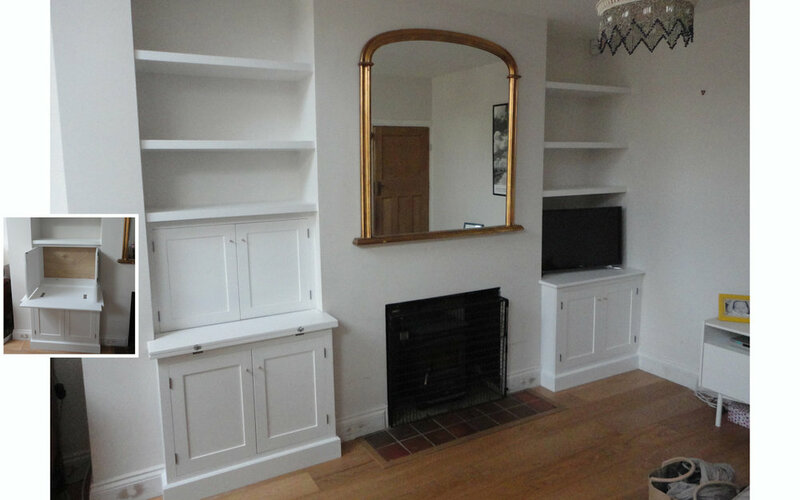 Wide mantelpiece flanked by alcove units with upper shelved sections. The oak Shaker-style kitchen features hand cut dovetailed drawers, a corner base unit for the butler sink and dishwasher, and a mahogany cutlery drawer tray (inset photo). The space under a staircase is often under-used. Here two pull-out storage racks provide a home for shoes while maintaining the original look of the entrance hall. A large storage drawer has the widescreen TV attached to the front. 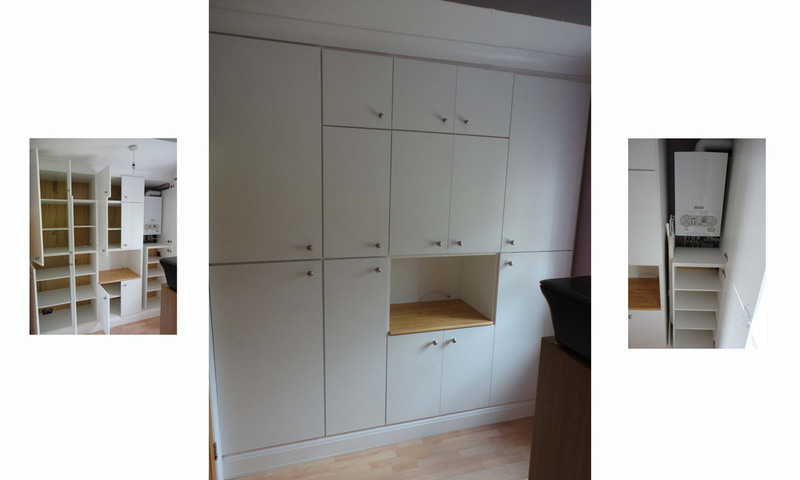 Cupboards provide storage and house the boiler. The inset photo shows the scale of the challenge here. With two drawers on full-extension runners, the ply and softwood bed platform provides useful storage. This elegant traditional glazed dresser has a solid oak top which contrasts perfectly with the paintwork (which itself matches the existing kitchen’s paint colour). 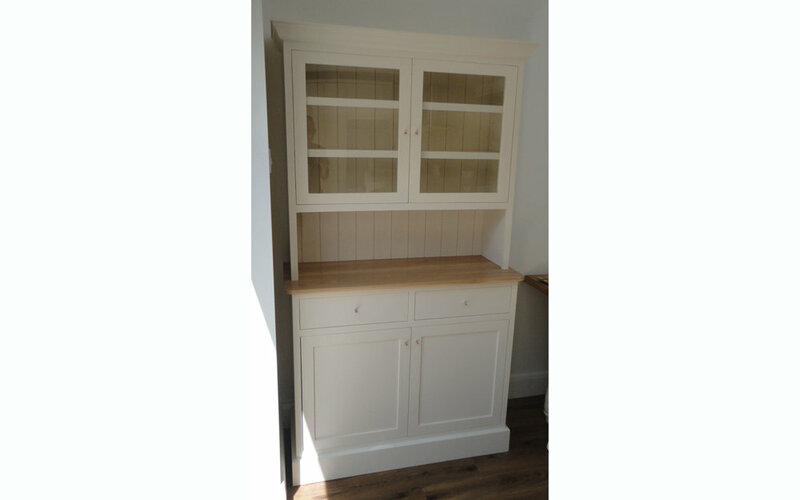 This unit has a single continuous 3.2 metre solid Oak top. Glazed cupboards flank a desk area which has concealed letter-trays. Two boys sharing this bedroom are afforded a desk each in addition to ample storage space. The doors on the cupboards were designed to match others in the room. Higher bottom shelf on the right gives ample space for the television. 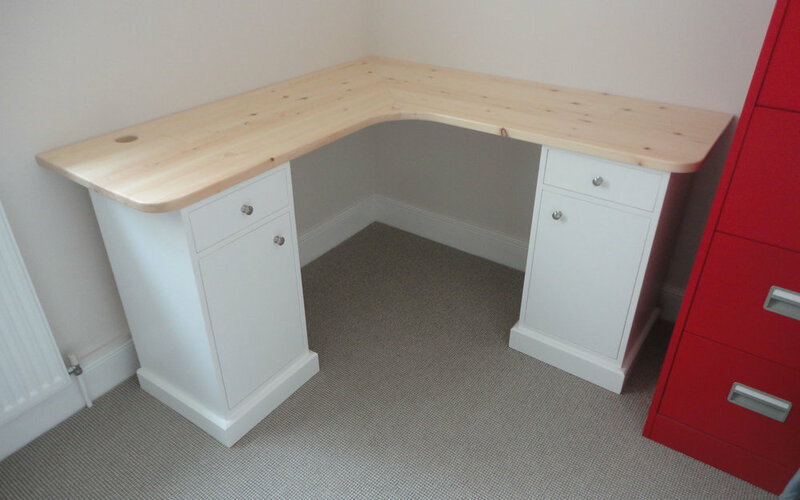 Solid pine desk top supported by twin pedestals. A king size mattress rests on the platform and its three drawers; a chest at the foot of the bed increases storage capacity. 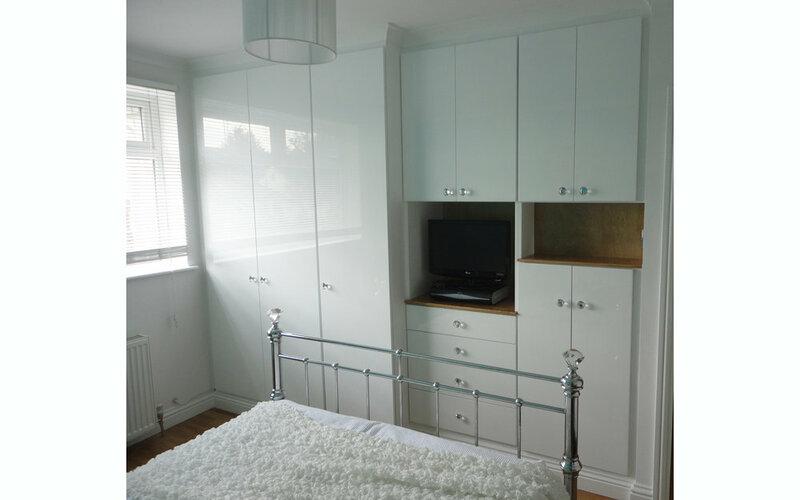 Of varied depth and distinctive multi-purpose layout, this wardrobe has been finished in a high gloss white to match existing bedroom furniture. Made to a customer's detailed drawing, the solid wood pew has shelving at one end designed for magazine display. Construction of these doors is solid oak (rails and stiles) with oak veneered panels, in keeping with other internal doors. 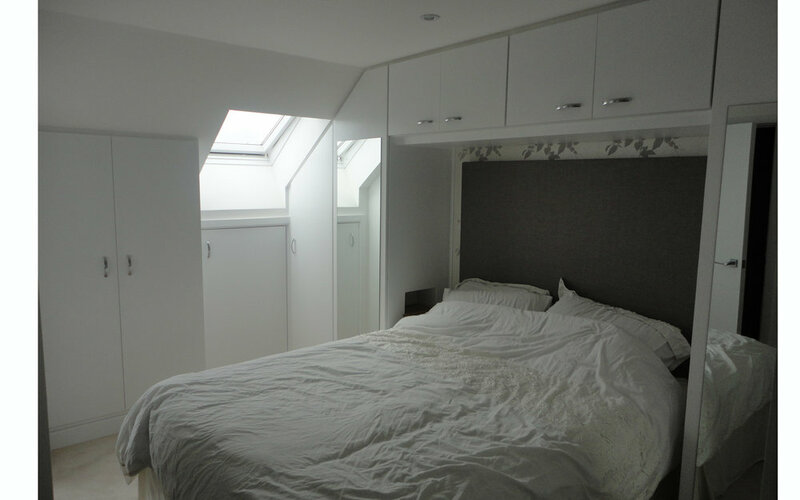 The second floor bedroom of this townhouse necessitated sloping wardrobes on three sides of the room. Cubby holes were designed for each side of the bed to rest phones, keys etc. 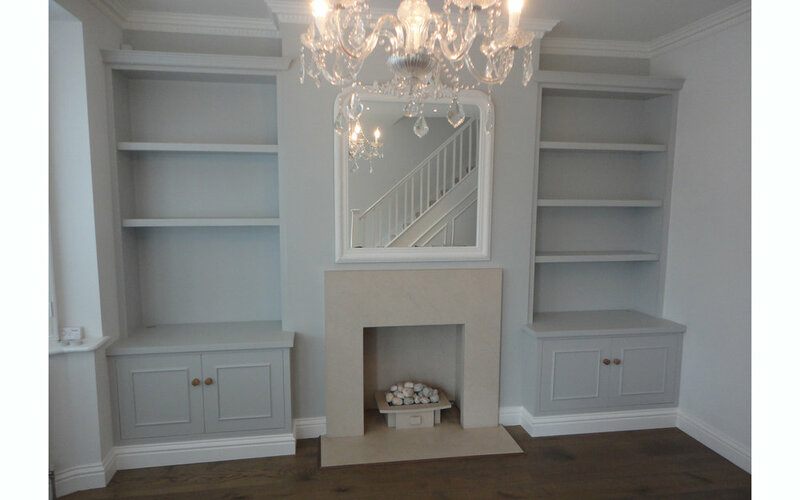 The cabinets and upper sections of the alcove units are finished using the same Dulux "Goosedown" as the walls to great effect. Structural elements of this vanity unit are made from dovetail-jointed timber, the visible areas from Oak veneered MDF. This large fitted unit has an open area for a television and storage housing the boiler (with provision for the ironing board). The house is made from plywood with pine tongue and groove cladding. It can be separated into a top and bottom half for easy transport. 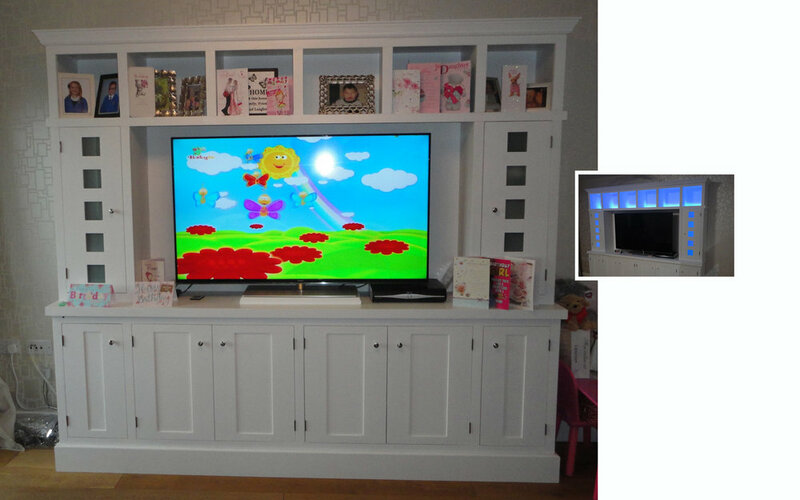 A large television is the focal point of this unit which also features open display areas, glazed cupboards and remote controlled LED lighting. The top of this cover was aligned precisely with the window sill and painted to match existing woodwork. The fitted wardrobe here incorporates a section for a television, a corner desk, some open display shelving and clothes storage space. In addition to the two drawers with flanking bookshelves, this window seat has triangular storage bins with pop-up hinged lids accessed from the top. This versatile unit with adjustable melamine-coated shelving was designed around the desk and washing machine. The longer shelves are strengthened with a strip of softwood. A bamboo work surface tops off this unit housing the washing machine and dryer behind bi-fold doors. A traditional free-standing wardrobe with open display shelving at each end and a chest of drawers with floating shelves above it provide a wide variety of storage options. The gas meter had been boxed into a plain cupboard while shoes were gathered in a basket on the floor (inset photo). A solid wood top now caps off a pair of cupboards whose doors are decorated with a wooden moulding. Made from oak veneered MDF with solid oak detailing, the piano-hinged lid makes this seat a useful storage chest. The left alcove has a drop down flap (supported by extending arms) in front of a shallow cupboard where a computer monitor is kept behind closed doors. This early 20th Century chest of drawers was recommissioned for use as a wash-stand. Note the adapted drawers to accommodate the plumbing. The curved ends of the two floating shelves flow into the side walls. Built to be housed in the garage, this double shoe cabinet has sloping adjustable shelves and a solid wood top. These shutters were made to replace those which would have originally been fitted to the front windows of this Georgian townhouse. 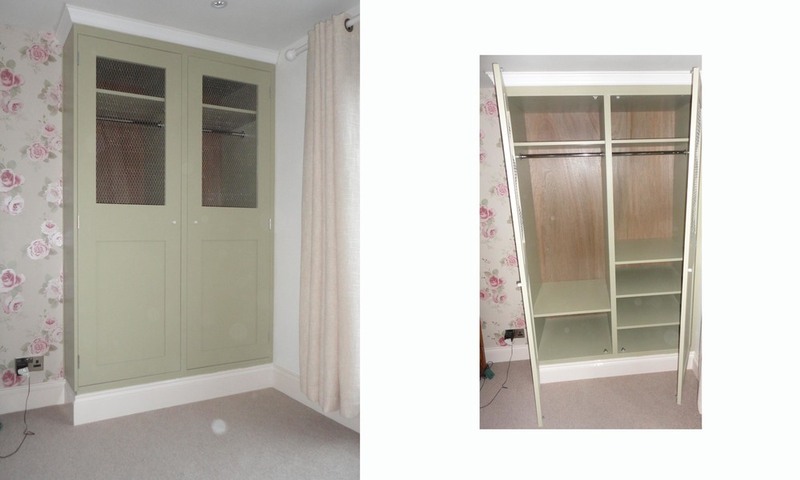 This wardrobe - one of a matching pair - was designed to complement the client's bedside cabinets. Finished using Farrow & Ball "Off-White". Stretching to almost 5.5 metres, this wardrobe conceals the curved section of ceiling and at its far extremity has a recess for the open curtains. Twin cupboards hide the various AV players, receivers and peripherals. Four deep cupboards occupy the space under the eaves of this conversion thus enabling tidy storage of bulky items often consigned to the loft. In order to maintain an unbroken run of tall, ornate skirting, the cupboards are fitted on high plinths. Open shelving either side of a narrow corridor were replaced with maple-veneered cupboards and sliding-door storage. A pair of large bookcases with thick, box-construction shelves designed for a large book collection - and two xylophones. Filling the space between wall and chimney breast, the large structure has adjustable shelves which have been strengthened with a strip of hardwood. The hardwood has been varnished to contrast with the white paintwork. A large desk unit fitted very closely to the radiator's thermostatic valve resulted in a radiator cover built to fit into an unusually tight space. 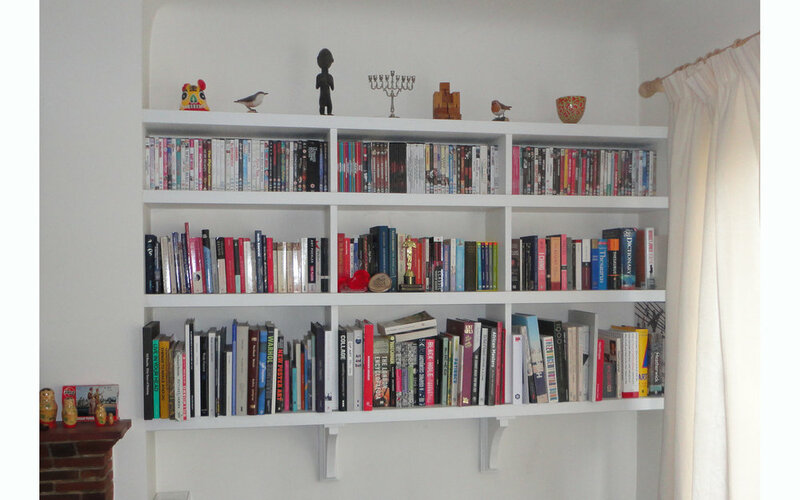 As can be seen from the inset photo, this bookcase was created for (some of) the client's large book collection to be displayed. The conversion of this garage into an extra room gave an opportunity to provide storage while concealing the gas meter (left) and electricity consumer unit. Unusually, the window here stretches into the corner of the bedroom. So as not to completely obscure the glazing (while maximising wardrobe depth), the far left section was built at an angle. A television will sit neatly in the central opening. Two sturdy floating shelves intended for book display match the oak floors and staircase. Floor to ceiling, wall to wall, this wardrobe maximises the available space. 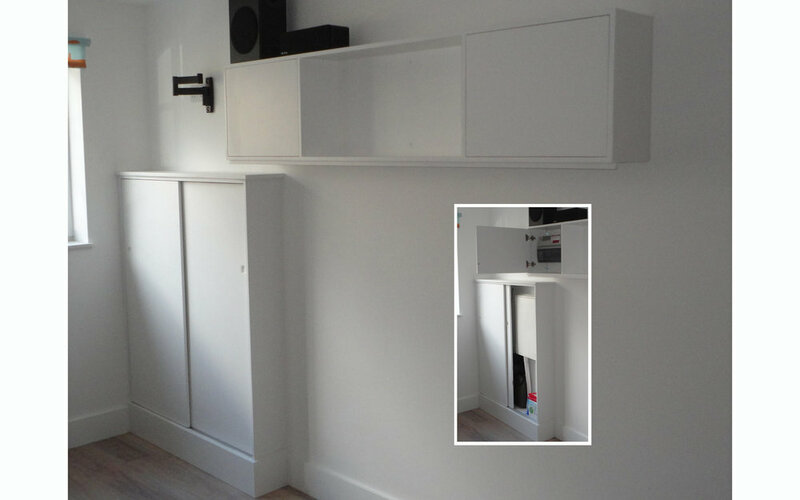 A boiler once in plain view can now be found inside a tall, elegant cupboard whose shelves can be removed should access to the pipework be required. Here chicken wire replaces glazing in the doors. Finished using Farrow and Ball "Ball Green". Left of the bed is a double wardrobe (shown inset) and on the other side, the wardrobe follows the ceiling line. Painted the same colour as the walls, the doors are opened using push catches. The proximity of the radiator necessitated the door to be hinged inset from the cabinet edge however interior space has not been reduced. The solid oak top matches the flooring material. These two alcoves in the same property both feature floating shelves above desks with solid wood tops. Made from solid wood and tongue & groove panels, this kitchen bench seat is made up of 4 lidded chests which if required can be separated into stand-alone individual units. 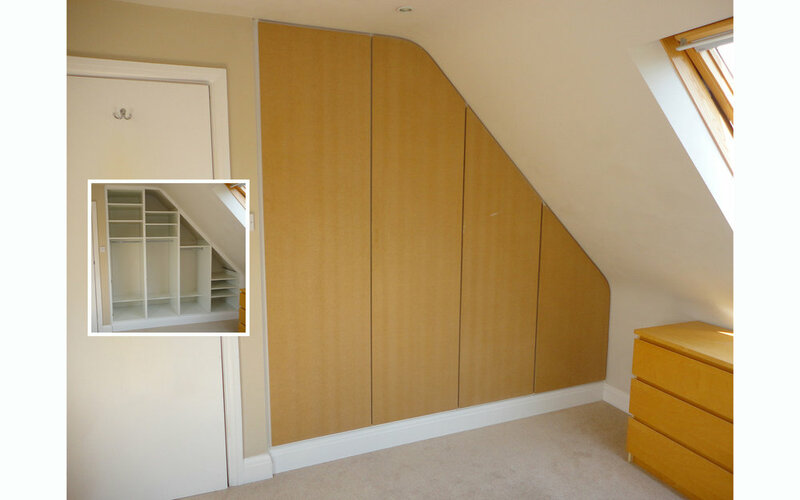 The final phase of installation of this wardrobe was to cut the doors (shown here unpainted) to follow the curved ceiling line. A long narrow entrance hall called for a correspondingly slim cover to hide the functional radiator. 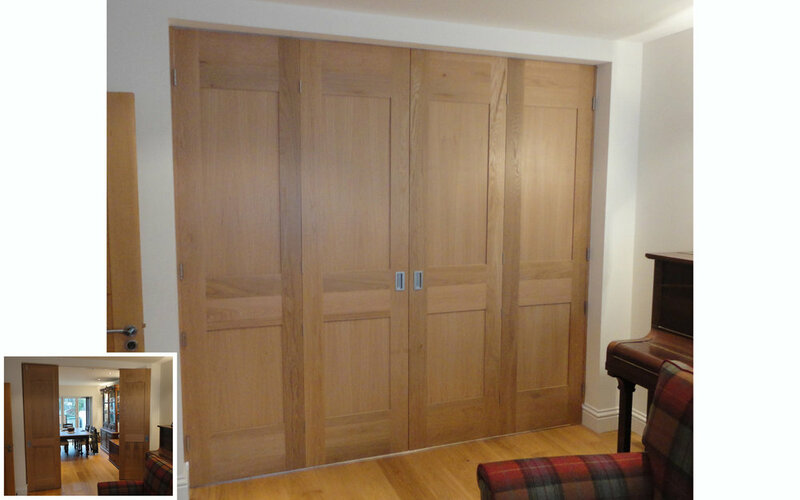 The doors of this wardrobe, made from oak veneered MDF, were shaped on-site to follow the ceiling line. Solid oak edging has been applied to the carcase (inset photo). Only the top section of this dresser (inset) was salvageable so a bottom section was made to match it using traditional joinery methods. The whole unit was then painted in an Aged White. 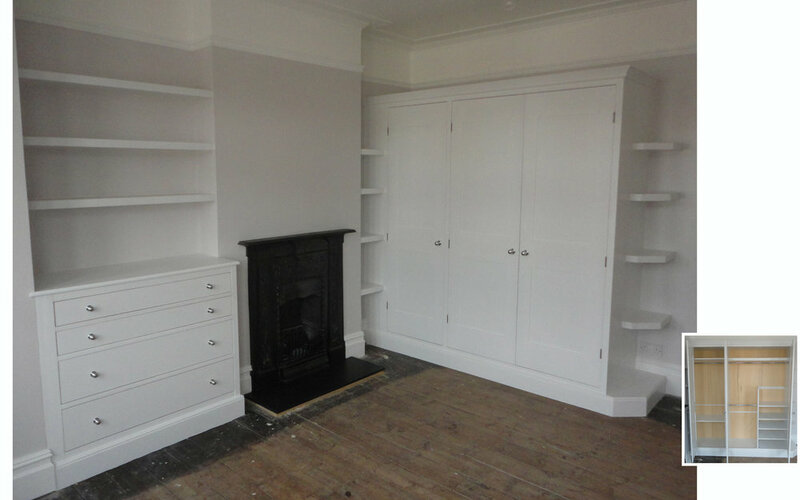 Asymmetrical shelves in a double bookcase; coving and skirting match the existing. Utilising bi-fold doors, this cabinet hides the washing machine. The right hand side of the oak top, when locked into the horizontal position as shown in the inset photo, can be used for folding or (occasionally) ironing clothes. This C-shaped fitted unit provides seating, and also storage for HiFi separates and around 1000 CD's. The inset photo shows the dummy drawer fronts hiding the HiFi. Open shelving gives an opportunity for books to be displayed while toys and games are kept behind the traditional frame and panel doors. The three plywood boxes are fitted with concealed castors; the main body of the unit is solid pine. Particularly suited to children's books, this bookshelf is based on a traditional design and uses modern materials and finish (Farrow & Ball All White Eggshell). The plywood chest has wooden mouldings and twin solid wood lids. Above it, attached to the wall is a coat rack with hat shelf. Here the narrow space between doorways necessitated a perfectly fitted cover. The cabinets hide everyday objects while the open shelving here proves ideal for photos, mementoes and books. Below the open shelf is a single handle-less drawer for DVDs, games controllers etc. 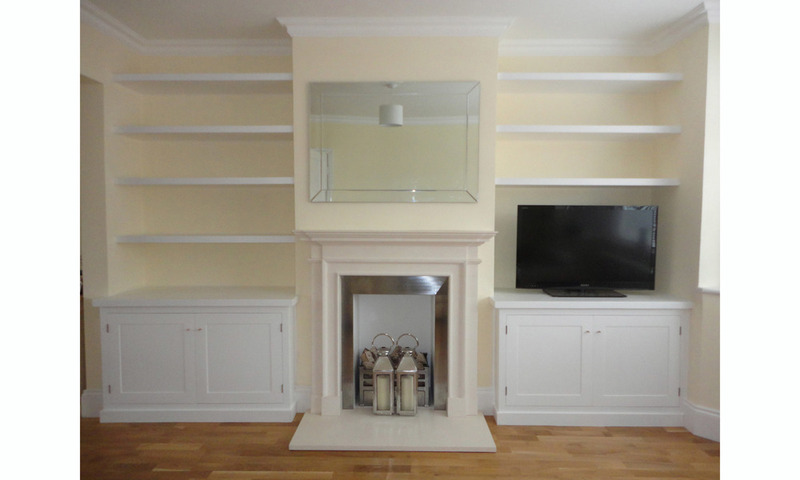 10 floating shelves have been fitted around this chimney breast with the left section arranged so that a television can be accommodated. A shallower recess on this side resulted in the bottom two shelves having a 45 degree splay at their left ends. These five floating shelves, with no wall to anchor to on the right hand side, have had the ends angled to obviate harsh-looking corners. These bookcases help to frame the entrance to the kitchen/diner while providing a substantial amount of open storage. The shelving, cupboard doors and letter trays are veneered maple. The desk slides under the right hand section. Inset photo shows previous open shelves. A child's bed was intended to fit right up against a wardrobe hence lower doors would have been inaccessible. The answer here was to create a chest above which a hanging rail and shelves provide traditional wardrobe storage. These shelves, spanning some 1.9 metres, are given extra support with wooden brackets which were designed to complement the Art Deco interior. 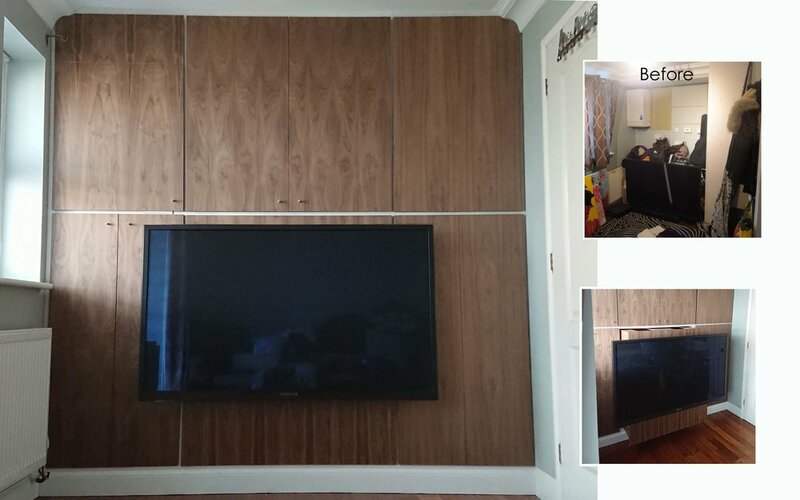 Oak veneered MDF was stained to match other bedroom furniture. The chimney-breast shelves flow seamlessly into the desk top. Designed by the customer, the bathroom cabinet has adjustable shelves and mirrored doors. Mirrors supplied by Mirror Mad of Barnet (mirrormad.com). This chest of drawers was made to match a similar existing unit but finished in gloss with a glass top. Plywood drawers are fitted using concealed self-close runners. The desk with pullout keyboard shelf is flanked by matching oak wardrobes. The drawers in these two chests have differing depths as allowed by the ceiling line. Next to them, open rails provide almost three metres of hanging space. The left hand shelves are spaced such that the owner's vinyl collection can be stored and displayed. With only two edges to anchor to the wall, these 36mm thick Oak bookshelves are held firmly with the use of deep battens concealed within them. The shallower far left section of this wardrobe results in efficient use of space while keeping the light from the window flowing in unhindered. With a 2 inch thick solid wood top, the desk sits beside a tall unit with internal space configured for specific appliances. Featuring four pairs of solid wood doors, the window seat provides storage space and a vantage point for admiring the garden. The dark floating shelves and cabinet contrast the light grey decor. Between the two upper glazed doors is an open display area. Upper and lower units fitted unpainted on request. 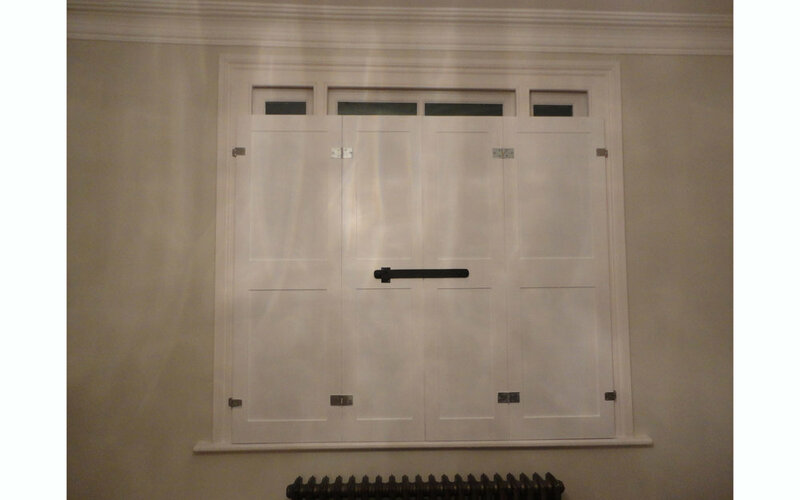 A very generously proportioned bed meant sliding doors on these alcove wardrobes were a must. Starting just above the skirting, these shelves offer ample book storage space.